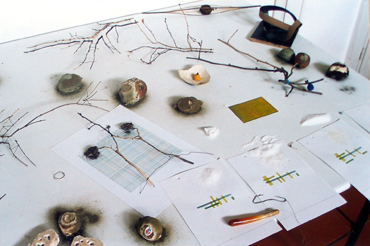 Table with objects is exactly that, a desk with various work objects above: models, tests or experiments, that although did not achieve "success" individually, together on a table, as they are in the studio create a landscape of clear paths of my artistic thinking. There are works that once done leave us, others fail in some way but are with us for long periods of time, closed in their inexhaustible mystery. 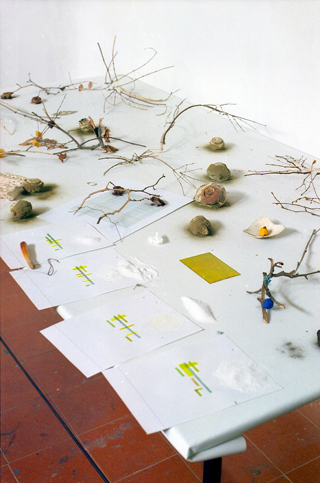 These works are likely sources for the artist, unresolved problems that continue to feedback the daily practice. That's the type of object I try putting up these tables. I must say that for me the studio is very important. 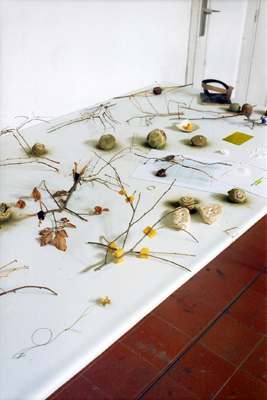 As a place where to do a work of synthesis, as a place that may relate to the time at another speed, where things find place to establish their relationships, where sediment. Made for the first time for an exhibition at a museum in Barcelona for which I had nothing convincing, I decided to show the process as it was developing in the studio. 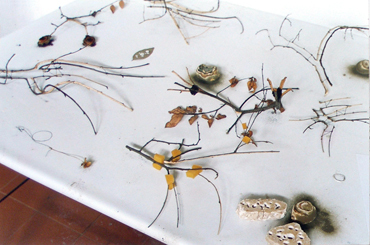 This was a important change in my way of thinking the art object: I realized that for me was more interesting to present a process rather than a finished work and indeed the process, the experimental period, is not a medium but an end in itself.